Summary: SWOT is an acronym that stands for strengths, weaknesses, opportunities and threats. A SWOT analysis is a tool or technique that can be used in business, design or personal settings to evaluate a project or company and to create constructive goals and strategies. The exact origin of SWOT Analysis has been debated. [i] Some people believe that it originated in the 1950s at Harvard Business School and was the work of professors George Albert Smith Jr and Kenneth Andrews. Others believe it was created by Albert S. Humphrey in the 1960s during his time at the Stanford Research Institute. Regardless of its origins, SWOT analysis has become quite popular, and may be one of the most widely used management decision-making tools among business managers. SWOT Analysis gathers data about internal issues within a company or project – strengths and weakness – and external issues outside of the company or project – opportunities and threats. It then analyzes this data to inform future goals, decisions, and strategies. The ultimate goal of SWOT analysis is to achieve a more successful outcome; for a company, the goal may be to improve performance and enhance growth. One of the most appealing feature of SWOT analysis is its universal applicability. SWOT analysis can hypothetically be used by any type of organization as a decision-making tool. It can also be used by individuals for similar purposes. Consider the following examples. EdTech designers – As a project is created, SWOT analysis can identify factors that lead to the eventual success of the project, while also considering risks and areas that need improvement. 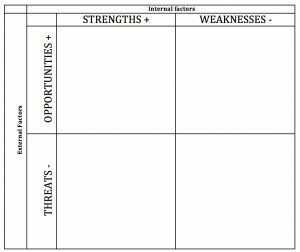 You can download a printable SWOT Analysis Template below (in Word and PDF formats). [ii] Houben, G., Lenie, K., & Vanhoof, K. (1999). A knowledge-based SWOT –analysis system as an instrument for strategic planning in small and medium sized enterprises. Decision Support Systems, 26, 125-135. [iii] Ommani, A. R. (2011). Strengths, weaknesses, opportunities and threats (SWOT) anlysis for farming businesses management: Case of wheat farmers of Shadervan District, Shoushtar Township, Iran. African Journal of Business Management, 5(22), 9448-9454. [iv]Ifediora, C. O., Idoko, O. R., & Nzekwe, J. (2014). Organizations stability and productivity: The role of SWOT anlysis an acronym for strength, weakness, opportunities and threat. Internatinal Journal of Innovative and Applied Research, 2(9), 23-32. [v] Uhrenfeldt, L., Lakanmaa, R., & Basto, M. L. (2014). Collaboration: A SWOT anlysis of the process of conducting a review of nursing workforce plilicies in five European countries. Journal of Nursing Management, 22(4), 485-498. Please cite this article as: esthermsmth, "SWOT Analysis Tool," in Learning Theories, September 30, 2017, https://www.learning-theories.com/swot-analysis.html.